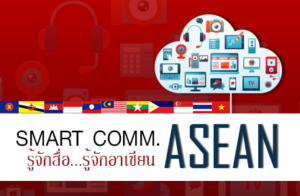 Description: The “ASEAN Commitment” (Smart Comm. ASEAN) is an ASEAN learning initiative that is keen to develop cooperation and strengthen its region as well. As reflected in the ASEAN Community Development Plan Including the 11th National Economic and Social Development Plan (BE 2555-2559) of Thailand focuses on regional development strategies for economic, political, social and cultural stability. By focusing on creating readiness. To enter the ASEAN Community This is a development of cooperation between all sectors to unity and standard. Internationally recognized To achieve the above-mentioned goal is essential for all Member States. Must have knowledge Mutuality This will lead to a good cooperation of the region. Because of good communication. It leads to mutual understanding. This will lead to the unification of ASEAN paths in the context of ethnic diversity, which will lead to the harmonization of the power of all ASEAN members in a sustainable manner.